Quality depth highlights the top story surrounding third basemen in fantasy baseball. Eight players with third base listed as one of their positions are featured in the top 50 overall in average draft position. Outside of outfield, this is the deepest position in fantasy baseball. I tend to favor some of the top players, like Nolan Arenado, Kris Bryant or Jose Ramirez, but if you plan to wait on the position, there are still some sleepers available. Here are three third basemen who have sleeper potential in the 2018 fantasy baseball draft. It’s tough to consider him a sleeper, but when Donaldson is rated as the sixth-best third basemen, then he has to be considered a sleeper. Even though he’s listed as sixth among third basemen, he’s still being drafted as the 29th overall player, according to ADP. That’s good value with Donaldson, who if he’s healthy again, will hit for power, drive in runs and score runs. When he’s highly productive, he can go over 100 runs, drive in around 100 runs and go for more than 35 home runs. Those are tremendous numbers for a player with an ADP listed in the third round. 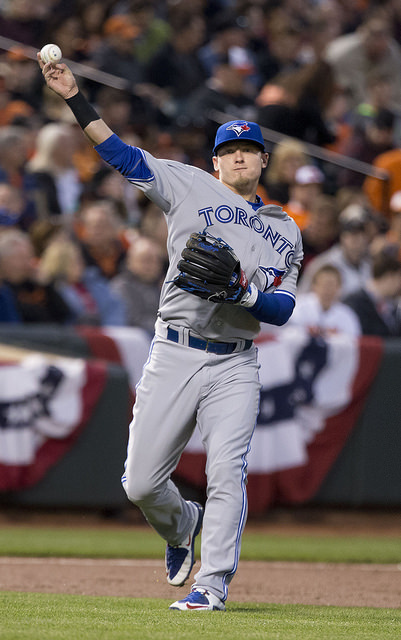 He’s seen a bit of a dip since having a career-year in 2015, but much like the Blue Jays, Donaldson should bounce back in 2018. He’ll be a major run producer and will finish better than sixth among third basemen in 2018 in fantasy baseball. Like I said earlier, I favor the top-tier third basemen, but if you’re going to wait in the draft for a third basemen, Turner offers some consistency. He’s not going to be a major contributor for your team, but he’s going to contribute in multiple categories. That provides him decent value as the ninth-best third basemen and 61st overall player, according to ADP. He’s not going to dominate in a specific category, but he’s going to contribute in batting average, RBI, homers and runs. If he continue to hit for power, his potential goes up. If you can get him maybe even later than 61st overall, his value should safely be in the sleeper zone. Based on potential and ADP, Shaw offers the best chance to find a real sleeper among third basemen. Shaw is listed as the 88th player, according to ADP, 10th-best among third basemen. There’s not much evidence on Shaw, but he’s consistently gotten better in the last three years, culminating in a breakout year in 2017. He went from 16 homers to 31 within a year’s time, and drove in 101 runs, bettering his career-best RBI by 30. Was 2017 an aberration? Maybe, but if he can string together a similar season in 2018, then his value is much better than anyone at third base. He’s still young, so there’s a chance he could see a drop in production. However, his potential for being a major contributor in fantasy baseball is good enough that he offers up some major sleeper value among third basemen.